This past week I had the privilege of helping my son and some others from his school paint windows in our local Akron Children's Hospital. 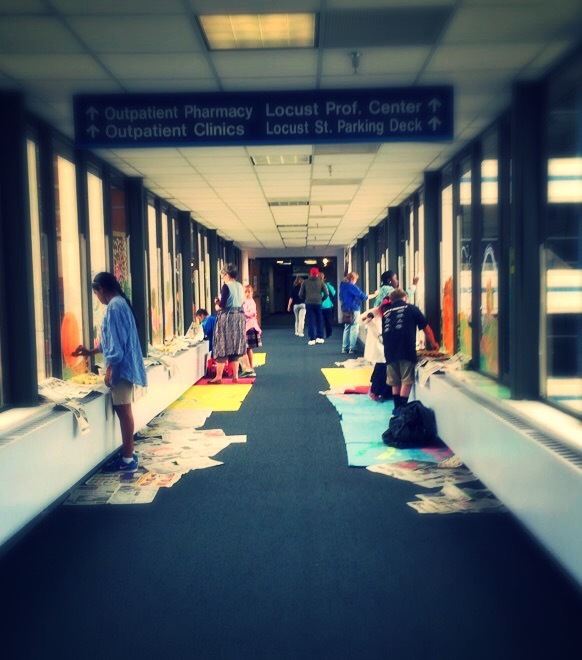 Our school has been painting windows at the Akron Children's Hospital at every change of season for years and I think it is such a great opportunity. 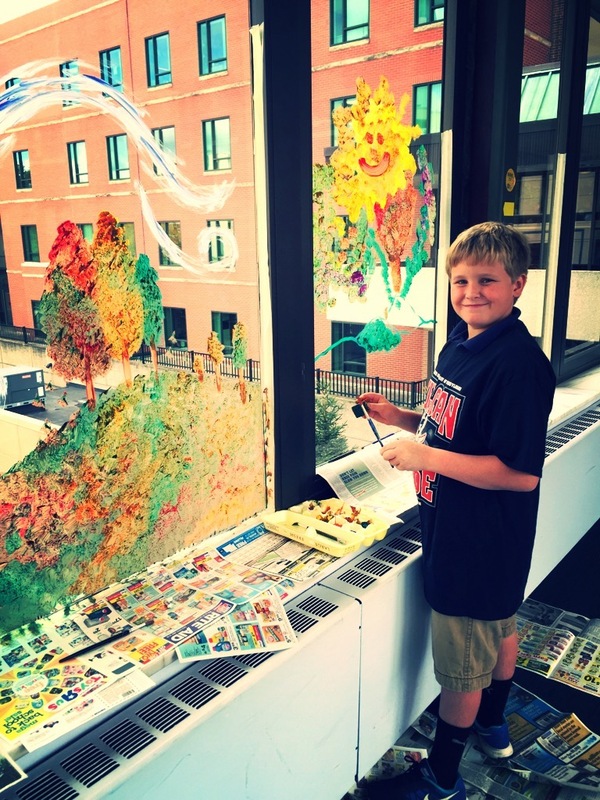 We were painting a fall inspired landscape in the windows of the Locust Street bridge. I just love opportunities to hang out with my kids during school hours and it was so much fun to work side by side with my son who is a little budding artist himself. It was so much fun watching him dip into the paint with excitement and paint what he envisioned to be a cheery fall landscape. As people passed by they had so many comments on how thankful they were to have something cheery to look at as they walked through this hall. There was a young girl waiting for a couple hours to get some test results and as she was checking out our paintings we invited her to join us! She was so happy to be able to pass her time this way, and the children from our school also got such joy out of having her be a part of our group! It was so good for me and our group of children to see how art can bridge the gap between people. Art can speak to others like a friendly voice. It can help cross all language or social barriers to help to form relationships where there might not have been any before. I love opportunities to be able to bless others through art and beauty and serving others in this way is also a great reminder to me not to focus on my little problems, because there are children in hospital rooms fighting for their lives right down the street from me. We have so much to be thankful for, even in hard times, and I hope that I can always stay grounded in that. I feel like we are all paint cans, sometimes more full than others, sometimes less full. Right now, my paint can is really full and I have a lot to give to others at this season in my life. There have been many seasons where my paint can has been pretty low and I welcomed other paint cans to pour some of their beautiful paint into my life. I want to always be thinking of ways to use the outpour of my life for others using all that God has blessed me with, because you never know, tomorrow I may not be able to give as much and will have to rely on others to lend me some of their paint.